I have been in full-time ministry since the age of 21. His hobbies include reading, writing and treasure hunting in various secondhand locations. 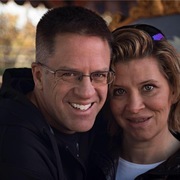 Ken and Arlene began their ministry at Gracepointe in November of 2014. "The churche's involvement in its people is two fold. First, it is to create an environment for disciple making. Whether it is in corporate worship through the preaching and teaching of the Word or in small group discussions, connectiing the community together is vital for strong and healthy relationships to take hold among all ages. Secondly, the church must provide the tools and resources for making our homes, expecially for our young families, a vibrant place to where Christ is taught and family altars abound. I am eager to continue to be a part of a church that professes and teaches scriptural holiness, to be with a people that are seeking a revival of God's Spirit in the church and a break through of His Spirit in all that we do. I thoroughly enjoy watching God work and move in and outside the church. I personally desire not just to be a better leader, but a better follower first. A follower of Jesus, for where He leads me I will follow. My song these days is 'Be Thou My Vision." I pray that my vision would first be His vision. What a joy it is to serve HIM!" Emily is originally from Lawrenceville, Georgia where she grew up leading worship for many different ministries including FCA, Young Life, mission trips, house church, and multiple youth group services and retreats. After graduating from High school she moved to Nashville, TN to attend Trevecca Nazarene University. She traveled with two different Public Relations groups leading worship all over the Southeast region during her Spohomore and Junior year at Trevecca. She graduated with a degree in Vocal Performance with a minor in Music Technology. She became the Worship Arts Pastor at Concord Community Church of the Nazarene in May of 2015 and served there for two years. In June of 2017, Emily and her husband Bryan felt called to begin their ministry at Gracepointe Nazarene Church, which happened to be the church Emily grew up in. Emily enjoys being outdoors, playing sports, and gathering with friends. She is passionate about reaching out to people and making sure that everyone has the opportunity to participate in a time of worship. It is our privilege to announce that Trevor Knudsen, a senior at Trevecca Nazarene University in Nashville, has accepted the position as Pastor to Youth and their families. May 19th will be his first Sunday. We look forward to having Trevor and his fiance', Hope Monet, being a part of our Gracepointe family.